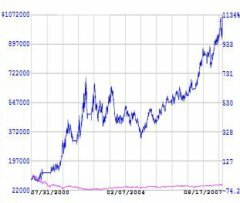 Backtesting: The chart shows how $100,000 invested in the Nasdaq-100 can become an incredible $1,070,000 in 8 years just by making a few trades per year, regardless of the direction of the markets. Not only has this worked, it is easy to do. Our custom computer software analyzes the stock market each evening, then makes recommendations each night. You check and follow any instructions for the following day. Typically, just one to two roundtrip trades per year are required. What's the most important part of investing money in the stock market? Is it WHAT you invest in, or WHEN you make the investment? The truth is, both of these factors will determine whether you have made a wise investment. Brokers and financial advisors are all about the WHAT rather than the WHEN. You can't blame them, WHEN is the really hard question. Plus - unfortunately, they know that having you wait to invest would likely affect their commissions. This is why some of the most common advice you will hear is: "You can't time the market." If so, why is it that 50% of stock market transactions are now traded by computer programs? That's an awful lot of money and computer hardware to throw at something that doesn't work! Not that trading is easy. It is devilishly difficult. Over 90% of investors who try to time the market themselves fail. This happens because, for every smart buy or sell you make, there has to be someone at the other end of your trade making a not-so-smart decision. That other trader is increasingly likely to be a computer. The truth is, the stock market isn't always investor versus investor anymore. It's investor versus computer. Which side of that transaction would you like to be on? Now you can play the stock market timing game, too. Our easy-to-use FREE computer trading system puts you in the same high-profit club the big investors are in. You invest in an exchange traded-fund or mutual fund. From time to time, we tell you whether to buy, sell, or hold for the upcoming week (short selling is an optional part of the strategy.) It's just that simple. In an average year, you might only have to move your money about three times. TradeWhen PRO PLUS takes the idea a step further. Instead of one set of trading signals, we give you twenty or more. You can use these market timing signals to manage an entire set of diversified mutual funds. Diversifying your timing signals as well as your investments can dramatically reduce risk and drawdown, potentially creating a very safe, steady, and ulcer-free ride in the stock market - while still allowing you to earn well above index rates. The low trading rate and mutual fund friendly nature of TradeWHEN makes it ideal for maximizing and protecting the return on your 401K or other retirement plan investments. Check us out!